More acts, including Sunday post-race Padang Stage headliner, to be announced in the coming weeks. 25 April 2017, Singapore - With less than five months to the 2017 FORMULA 1 SINGAPORE AIRLINES SINGAPORE GRAND PRIX, race promoter Singapore GP today unveiled a stellar lineup of headliners for the tenth edition of the night race to be held on 15, 16 and 17 September. Adding to the celebratory atmosphere at the Marina Bay Street Circuit are Ariana Grande, Duran Duran, George The Poet, Lianne La Havas, OneRepublic, Seal and The Chainsmokers. Access to all the headlining concerts in Zone 1 is included with any three-day Zone 1 ticket (from S$448), whilst access to all the concerts in Zone 4 is included with any three-day Zone 4 ticket (from S$248). See Annex A for ticketing information. American television star turned pop singer Ariana Grande will perform for the first time in Singapore at the 2017 FORMULA 1 SINGAPORE AIRLINES SINGAPORE GRAND PRIX. Her music career took off in 2013 with her first studio album Yours Truly which debuted at #1 on the US Billboard 200 and was certified triple platinum. Her second album My Everything saw similar success, enjoying the top spot in the US with five hit singles spending 34 continuous weeks in the Top 10 of the Billboard Hot 100, garnering her recognition as the artist with the most Top 10 singles in 2014. Her third studio album in 2016, Dangerous Woman, debuted at #2 on the Billboard Hot 100. The 23-year-old has won 39 awards including three American Music Awards, Music Business Association's Breakthrough Artist of the Year, an MTV Video Music Award as well as 109 nominations including four Grammy Award nominations. Her popularity is evident with her Instagram account being tagged as the fourth most followed, and solidified with the recognition as Time 100's Most Influential People In The World in 2016. Best known for her powerful vocals, fans can watch her live in Singapore for the first time when she performs her hits 'Side To Side', 'Into You', 'Bang Bang', One Last Time', 'Let Me Love You' and more at the Padang Stage on Saturday, 16 September. Since their debut in 1981, DURAN DURAN have released fourteen albums, garnered sales of more than 100 million records, and been honoured with numerous prestigious accolades, including two Brit Awards, two Grammy Awards, seven Lifetime Achievement Awards and a star on the Hollywood Walk of Fame. They are also one of only a handful of artists to have had albums in the US Top 10 across three decades - and one of even fewer to have had an astounding twenty singles land in the Top 20 since their inception. 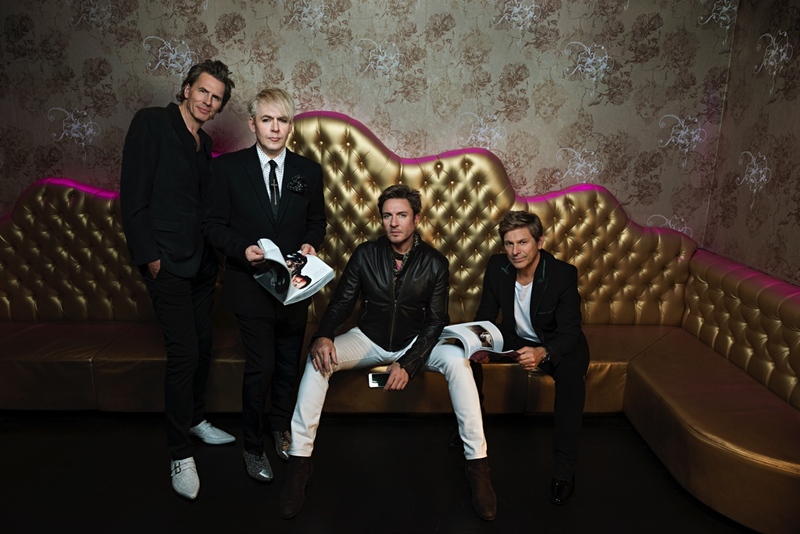 Duran Duran's most recent critically acclaimed album Paper Gods debuted at #10 on the Billboard 200, showcasing stellar collaborations with Janelle Monáe, Kiesza, Nile Rodgers and Mr Hudson (amongst others). A sold out arena tour followed, alongside headlining slots at some of the world's coolest festivals. Later this year, when they play in Singapore for the first time on this world tour, fans can look forward to classics such as 'Hungry Like the Wolf', 'Ordinary World' and 'Save a Prayer' alongside recent hit singles 'Pressure Off (feat. Janelle Monáe and Nile Rodgers)' and 'Last Night in the City (feat. Keisza)' when they perform at the Village Stage on Saturday, 16 September and at the Padang Stage on Sunday, 17 September. A London-born spoken word performer of Ugandan heritage, George the Poet's innovative brand of musical poetry has won him critical acclaim both as a recording artist and a social commentator. George took up spoken word while studying Social and Political Sciences at King's College, Cambridge. It was here that George won a social enterprise competition by Barclays and Channel 4 called "The Stake", earning him a £16,000 grant to deliver poetry workshops to disadvantaged young people. Shortly after graduating, George the Poet embarked on a music career, culminating in the 2014 release of his debut effort, The Chicken & the Egg EP. A critical success, the EP earned George a string of nominations, including the Brits Critics' Choice Award, MTV Brand New Award and BBC Sound of 2015 Shortlist. 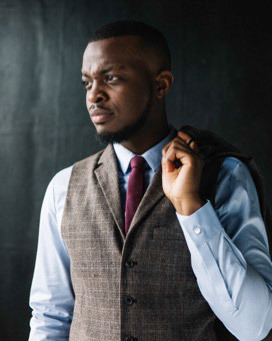 Fans of the spoken word can look forward to some thoughtful social commentary by George the Poet at Downtown on Saturday, 16 September and Esplanade Outdoor Theatre on Sunday, 17 September. Lianne La Havas made a huge breakthrough with her top five debut album in 2012 Is Your Love Big Enough? which sold 200,000 copies and won Album of the Year at iTunes as well as Barclaycard Mercury Prize and Ivor Novello Best Album nominations. Her debut single of the same name provided more highlights in its lifecycle than many artistes experience in their entire career - with over 120 shows across Europe, North America, Japan and London. Featuring neo style and jazz tunes, her second album, Blood peaked at #2 in the United Kingdom, #1 in the Netherlands and Norway and received a nomination for Best Urban Contemporary Album at the 2016 Grammy Awards. 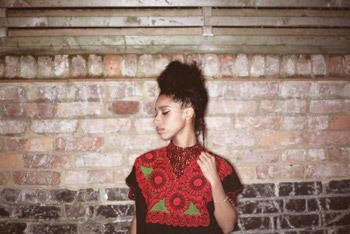 Dubbed Britain's next big female star by Daily Mail, La Havas' performance career has also seen her featured as a supporting act to Alicia Keys, Bon Iver, Jools Holland, Paloma Faith, Prince, and most recently to Coldplay in their latest tour. Fans of the powerhouse singer can look forward to her debut performance in Singapore featuring hits from both albums including 'Unstoppable', 'What You Don't Do', and 'Is Your Love Big Enough?' at the Padang Stage on Friday, 15 September and Village Stage on Saturday, 16 September. 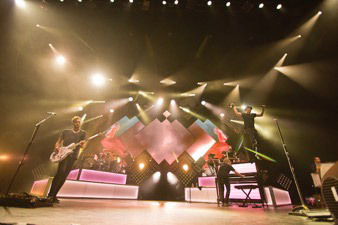 Pop rock superstars OneRepublic gained mainstream fame with their 2007 smash hit 'Apologize' from their debut album Dreaming Out Loud. The single received the largest amount of airplay in radio history and was ranked Top 50 on the Billboard Hot 100's All-Time Top Songs list. The second hit single from their platinum debut album 'Stop and Stare' saw almost equal success. In 2013, OneRepublic's third album Native charted at #4 on Billboard 200 album chart and their third single 'Counting Stars' reached #1 in 54 countries. In 2016, the Colorado quintet released their fourth and highly anticipated studio album Oh My My, which debuted at #3 on the US Billboard 200. The band has won several music awards and landed nominations for the Grammy Awards, American Music Awards, Billboard Music Awards and World Music Awards. Race fans can groove to their hit radio anthems including 'Counting Stars,' 'Wherever I Go', 'Secrets', 'Love Runs Out' and 'If I Lose Myself' at the Padang Stage on Friday, 15 September. Since the beginning of his career in 1991, British multi-platinum singersongwriter Seal has released nine studio albums, two live albums, two compilation albums, 28 singles and four video albums, with worldwide sales of his first eight studio albums exceeding 30 million. On the heels of his stunning debut album, Seal, he went on to win the prestigious BRIT Award for Best British Male in 1992. His hit single 'Kiss From a Rose' - memorably included in the Batman Forever soundtrack - earned him four Grammy awards, an MTV Video Music Award and global esteem. Seal's ninth album, 7, released in November 2015, reunites him with superproducer Trevor Horn. The artist's focus remains where it's always been, on the many permutations of love. 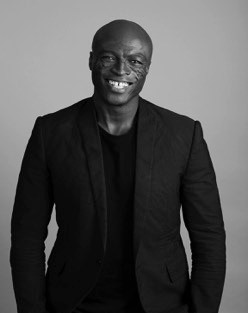 Seal returns to The Voice Australia as a coach in 2017, after his past appearances on the show in 2012 and 2013. Fans of the smooth R&B and soul crooner can look forward to his debut full-length concert in Singapore with hits such as 'Kiss From A Rose' and tracks from his latest album, 7 including 'Every Time I'm with You', 'Do You Ever' and 'Life on the Dancefloor' at the Village Stage on Sunday, 17 September. 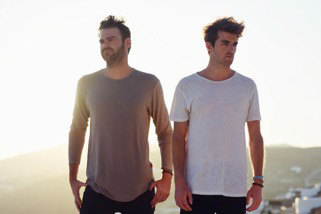 With over five billion global streams and three multi-platinum singles, Drew Taggart and Alex Pall of The Chainsmokers have performed worldwide to sold-out crowds at their own headline shows and major music festivals including SXSW, Ultra and Coachella. Their debut album, Bouquet - which was released in 2015 - featured the hit single 'Roses' and reached the top 10 on the US Billboard Hot 100. 'Don't Let Me Down' became their first top five single there, while 'Closer' became the first song to spend 26 weeks in the top five of the Billboard Hot 100 chart. The New York based electronic dance music duo has also been recognised with a Grammy award for Best Dance Recording, an American Music Award, five iHeartRadio Music Awards with nominations for two Billboard Music Awards, two Teen Choice Awards and two MTV Video Music Awards. The Chainsmokers will be showcasing a full-length concert in Singapore for the first time at the Padang Stage on Saturday, 16 September. Fans of the dynamic duo can look forward to a highly energetic performance with chart-topping singles such as 'Something Just Like This', 'Closer', 'Don't Let Me Down', 'Roses', 'All We Know' and 'Paris'. Less than two weeks for race fans to enjoy significant savings of up to 28% off regular ticket prices during the early bird phase for the 10th instalment of the Formula One™ night race. Tickets for the 2017 FORMULA 1 SINGAPORE AIRLINES SINGAPORE GRAND PRIX are available for sale at www.singaporegp.sg, via the ticketing hotline +65 6738 6738 as well as all authorised ticketing agents. The artiste line-up and schedule is subject to change. More acts, including the Sunday post-race headlining act, will be announced in the coming weeks. 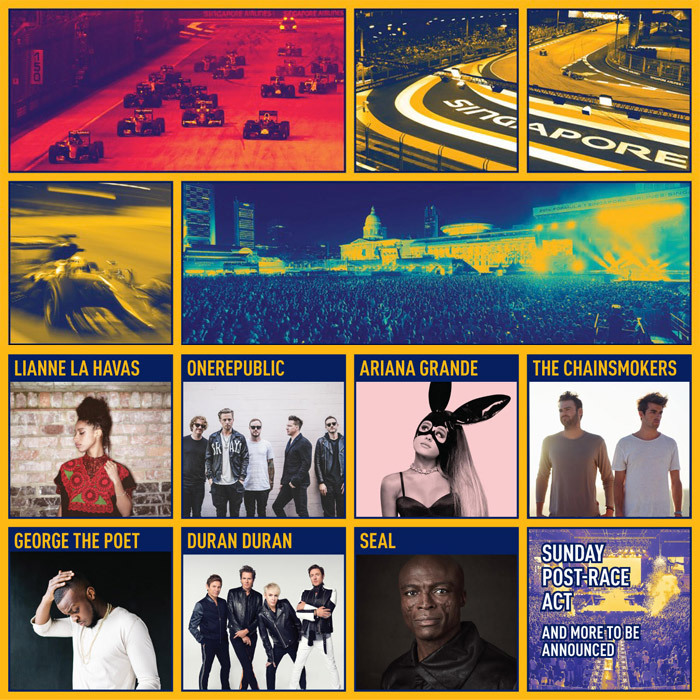 For the latest 2017 FORMULA 1 SINGAPORE AIRLINES SINGAPORE GRAND PRIX programme line-up, visit www.singaporegp.sg.